Jamie Baldridge is a professor of fine arts at the University of Louisiana. He is also a photography artist and combines his photographs with various digital images to create carefully constructed complex narratives. Bernhard Buhmann is an Austrian based in Vienna. He expresses himself through his layered oil paintings. The two artists are showcasing their latest work at an exhibition in Dubai titled Versus. Although their choice of medium and approach are different, they have both explored similar themes of fragility, relationships and journeys. Both artists are inspired by famous masters of the past and strive to give their contemporary artworks a classical feel. Baldridge has a very deliberate and planned approach. "For me, every artwork begins with a small story that I write. This could be inspired by a dream, an experience or something I have seen in the media. I then make a visual translation of the story in the form of a detailed sketch. After that I call my models and get them to pose for photographs exactly as visualised in the sketch. I then combine these photos with a variety of digital images to build up the entire scene," he says. The scenes he creates are complex and his attention to detail is impressive. In his latest series, titled Playing With Arsenic, Baldridge has dressed his models in vintage clothes and used elements such as photographs of weathered walls and stained-glass windows from ancient European buildings to create the 1930s look. The light and muted palette in his work is inspired by Vermeer. The series deals with the fragility of relationships through a range of emotional narratives. In Pattern of Monstrosity, the body language of the couple conveys a strained relationship. 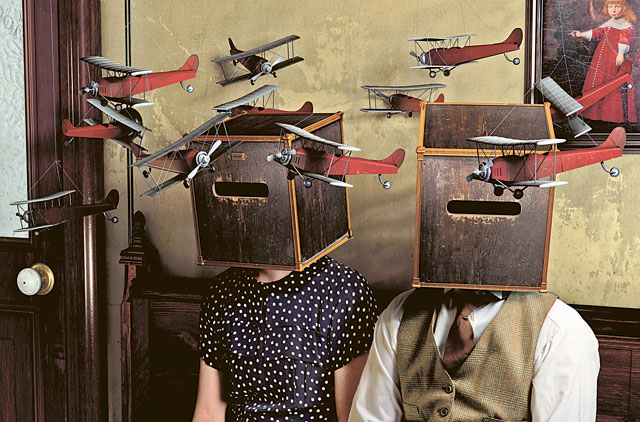 Their heads are covered with crates, conveying the idea of sensory deprivation, loss of identity and perhaps the desire to run away from the stresses of daily life, represented by the tiny aeroplanes hovering over their heads. Similarly, in The Hindenburg Signal Ballet, the artist uses allegorical references, such as a dancer standing precariously close to the edge of the stage, a communications tower with cables, and pictures of the Hindenburg airship disaster of 1937 to convey loss of communication and volatile relationships. Another work, in which a woman is confined inside an ornamental chest of drawers, provokes viewers to think about the objectification of sexuality and women. Baldridge's feelings about the present situation in Syria are expressed through images of a home with shattered windows and family photographs. "These artworks are composed of various moments, emotions, experiences and environmental stimuli. Seeing the finished works helps me understand better what was going on in my own mind when I made them. So a few months after I complete a series, I write a book, which has a story related to every artwork and ties the series together. As I look back at this series, I can see that it is about personal and political relationships. On the political level, the title refers to my country's foreign policy, which is like playing with arsenic, a substance that is dangerous and destroys without leaving any trace," the artist says. Buhmann's approach is totally spontaneous, and he does not make any sketches or plans before starting work on a painting. His imaginary narratives make witty and incisive comments about contemporary society. His latest series of paintings depict a variety of fantasy flying machines. Some of the machines are inspired by bees and birds, and they include pieces of real machinery along with imaginary components, giving the illusion of something that works. In his signature style, Buhmann has also included elements from his previous work, such as beautifully textured wooden planks from a series on fantasy houses and brightly coloured tents from a recent series on that subject. A recurring motif in the paintings is an image of a lost and helpless-looking man trapped inside the machines. Despite the contemporary theme, his classical palette and painting technique give his canvases a poetic and timeless feel. "When you look at the financial crisis and the general state of the world today, you realise that those in charge are pretending that the system can work. But in reality it does not; and we have lost control. So the idea behind this series was to create these impressive and complex machines that look like they will work, but are actually dysfunctional. And these poor little people are lost inside and have no idea what is happening. They want to go somewhere, but do not know the destination. They want change, but have no idea what it will lead to," Buhmann says. Versus will run at Carbon 12 gallery, Al Quoz, until June 15.